Objective: Type 2 diabetes mellitus (DM-T2) is commonly associated with increased triglycerides (TG), low-density lipoprotein cholesterol (LDL-C) and low high-density lipoprotein cholesterol (HDL-C) levels. Fibrates like gemfibrozil are frequently used in diabetic patients to decrease TG and increase HDL-C levels. We compared the efficacy of Vitamin C, an antioxidant vitamin, with gemfibrozil on serum HDL-C in diabetic patients. Methods: Type 2 diabetic patients, referred to our out-patient clinic were randomly divided into three groups. 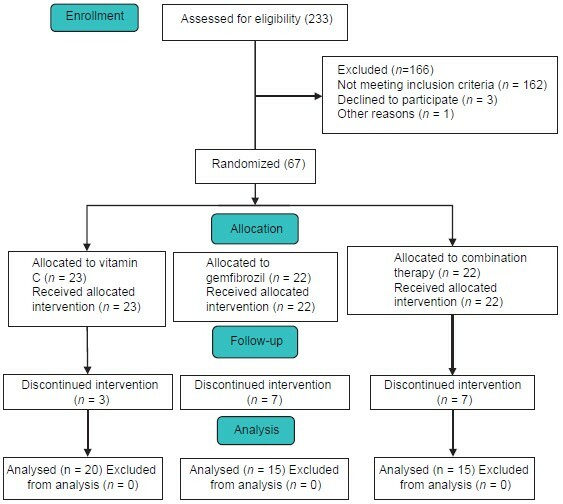 After 1 month of lifestyle and diet modifications, groups A, B, and C were prescribed 1000 mg Vitamin C, 600 mg gemfibrozil and combination of both, respectively. Before the study initiation and after 6 th week of drug prescription, the blood samples were taken and analyzed for total cholesterol (Total-C), HDL-C, TG, fasting blood sugar (FBS), and hemoglobin A1c (HbA1c) levels. Findings: Sixty-seven patients entered, and 50 patients (18 male, 32 female) finished the study. Overall, serum HDL-C increased significantly from 39.8 to 45.2 mg/dL in the participants (P = 0.001). HDL-C increased 6.3, 4.4 and 5.0 mg/dL in groups A, B and C, respectively (related significances were 0.017, 0.022 and 0.033, respectively). Significant decrease of serum TG and Total-C occurred in gemfibrozil and combination groups, but not in Vitamin C group. Changes in serum HDL-C between three groups were not significant (P = 0.963). We found a significant decrease in TG and Total-C in the groups B and C (P < 0.05), but no significant changes of TG, Total-C, LDL-C, FBS and HbA1c in group A (P > 0.05). Conclusion: The results demonstrated that Vitamin C may have beneficial effects on HDL-C in diabetic patients without significant effects on plasma glucose or other lipid parameters; however, its role for the treatment of low HDL-C patients should be evaluated in larger studies. Objective: Brand-generic scheme was implemented in Iran to improve the competition in the pharmaceutical market. In this study, we aim to assess if this policy had any positive effect on efficiency of Iranian pharmaceutical companies. Methods: We used data envelopment analysis to evaluate the relative efficiency of pharmaceutical companies during 1999-2008. The Wilcoxon matched-pairs signed-rank and sign tests were used to assess the difference between mean technical efficiency of companies before and after implementation of the new policy. Findings: Although the Wilcoxon matched-pairs signed-rank tests did not show any significant differences in favor of the new policy in terms of both relative and pure (managerial) technical efficiency for included companies (P = 0.079 and 0.07, respectively), but the one-sided sign test indicated that only relative pure (managerial) efficiency has been improved after this policy (P = 0.031). 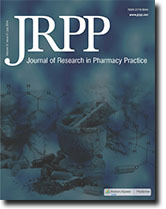 Conclusion: The "brand-generic scheme" does not seem to be a successful policy to improve efficiency level and prompt competition in pharmaceutical companies in Iran. To achieve this aim, consideration of infrastructural requirements including transparent and non-discriminating laws and regulations to support competition, the competitive pricing policies, the presence of international companies in the market, and full privatization of companies had to be also deeming by policy makers. Objective: Intraoperative hypothermia is a common problem with anesthesia. Spinal anesthesia, the same as general anesthesia, affects the process of temperature regulation. The aim of this study was to compare the prophylactic effect of intravenous (IV) ondansetron with intrathecal (IT) meperidine on prevention of shivering during spinal anesthesia in patients underwent orthopedic surgery of the lower limb. Methods: In this study, 120 patients with American Society of Anesthesiologists physical status I to II, between the ages 16 and 65 were randomized into three groups. Group O and Group M were given IV ondansetron 8 mg and IT meperidine 0.2 mg/kg, before spinal anesthesia, respectively. Group C received IV saline 0.9%. The core and ambient temperatures, the incidence and intensity of shivering, blood pressure, heart rate, and maximum level of sensory block were recorded. Findings: Shivering was observed in 15%, 2.5%, and 37.5% of patients in Groups O, M, and C, respectively. There was a significant difference between Group O and M compared to Group C (P = 0.023 for Group O vs. Group C, P < 0.001 for Group M vs. Group C, P = 0.049 for Group M vs. Group O). Shivering incidence and intensity in Group M was significantly lower than Group O (P = 0.049 and P = 0.047, respectively). 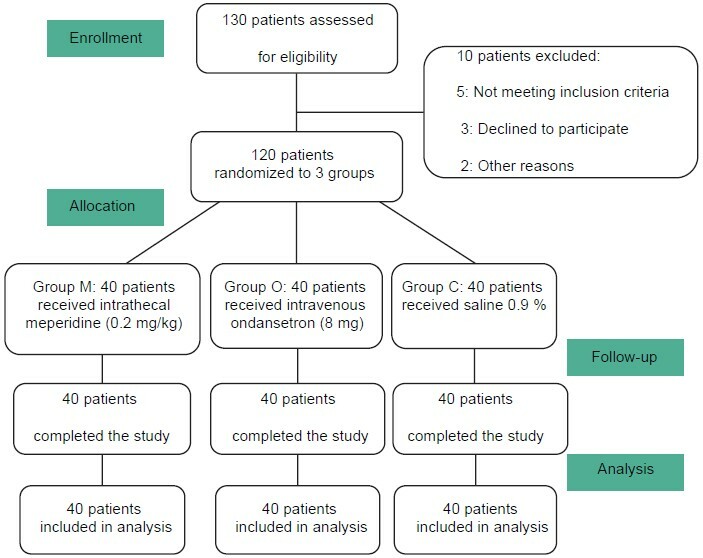 Twenty-two patients required additional IV meperidine among which 15 patients were from Group C (37.5%), six patients from Group O (15%) and one patient from Group M (2.5%). Conclusion: We concluded that IT meperidine and IV ondansetron comparably can decrease intensity and incidence of shivering compared to control group as well as decreasing the requirement to additional doses of meperidine for shivering the control without any hemodynamic side effect. Objective: The pure essence of plants (essential oils) provides both psychological and physiological benefits when used accurately and safely. Conventionally, Lavender oil is known for relaxing, carminative, and sedative effects. Hence, an attempt was made to know the effect of Lavender essential oil on dental patient anxiety. 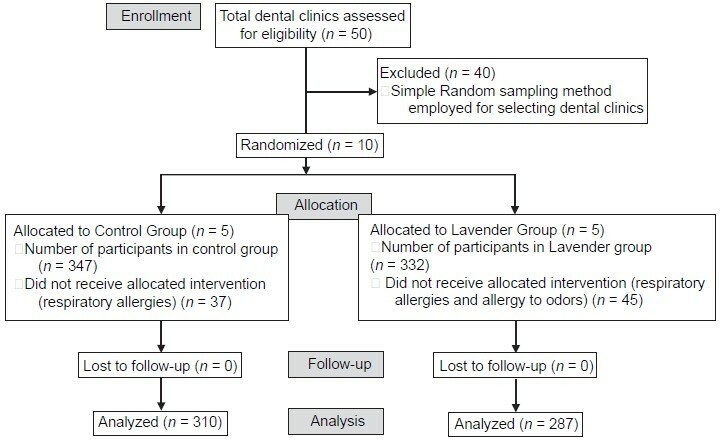 Methods: The present study included two comparison groups (Lavender and control group), each comprising five dental clinics. In Lavender group, the ambient odor of Lavender essential oil was maintained with the help of a candle warmer in the reception area and in the control group, candle warmer with normal water was used. A total of 597 patients, aged above 18 years were included. A questionnaire comprising demographic information, and a modified dental anxiety scale was given to the patients in waiting room, and data regarding anxiety levels was recorded. Findings: Student's t-test (unpaired) showed a significant reduction in anxiety scores of Lavender group compared with the control group. Analysis of variances test showed reduction in anxiety scores as age increased in Lavender group. Conclusion: Fragrance of Lavender oil at reception area may effectively reduce the patient's state or current anxiety. This practice on routine usage can improve the quality of dental treatments. Objective: This study aim to evaluate and compare type and prevalence of drug-drug interactions (DDIs) in prescriptions dispensed in both community and hospital setting in Zabol, Iran. Methods: A total of 2796 prescriptions were collected from community and inpatient and outpatient pharmacy of Amir-al-momenin only current acting hospital in Zabol, Iran. The prescriptions were processed using Lexi-Comp drug interaction software. The identified DDIs were categorized into five classes (A, B, C, D, X). Findings: Overall 41.6% of prescriptions had at last one potential DDI. The most common type of interactions was type C (66%). The percentage of drug interactions in community pharmacies were significantly lower than hospital pharmacies (P < 0.0001). Conclusion: Our results indicate that patients in Zabol are at high risk of adverse drug reactions caused by medications due to potential DDIs. Appropriate education for physicians about potentially harmful DDIs, as well as active participation of pharmacists in detection and prevention of drug-related injuries, could considerably prevent the consequence of DDIs among patients.